On March 27 the 2014 Paris Art Fair will start at the Grand Palais. There will also be a lot of art happening within Paris and it's always fun and interesting. 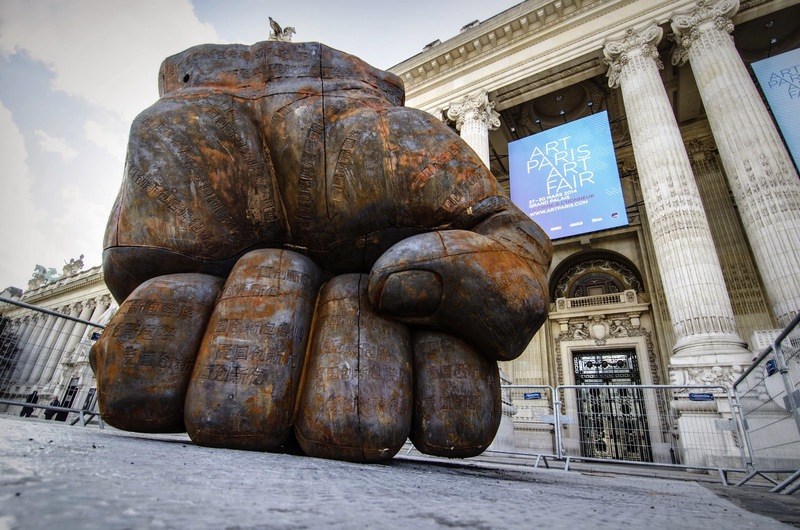 To start with, here is the giant iron fist that Chinese artist Liu Bolin (劉勃麟) had installed in front of Le Grand Palais, where I took this photo on Saturday. A beautiful and massive piece of art (7,60 meter high - 25 feet) and 7 tons) that is also - according to Liu Bolin - a political claim. It reminds me, oddly, of those Communist sculptures you'd have seen broken down into pieces after the fall of the Wall. All that's needed are some paintings and sculpture underneath. Even so, I think I get it. "Taper du poing sur la table" ! J'aime ce mot : "poing", avec un g plutôt qu'un t. Et quelle image, quelle sculpture ! Merci pour ce post, instructif qui plus est. Have a nice stay in the US ! I don't usually like commercials all that much, but this series is hilarious and this one matches the art! My kids are laughing too. That sculpture makes quite a statement!